I got this jacket ages ago when I was visiting England. I was happy to be able to pull it out of my closet on this cold, wet day. I always feel like one of the guards at Buckingham Palace when I’m wearing this coat because of the bright red colour and the structure. 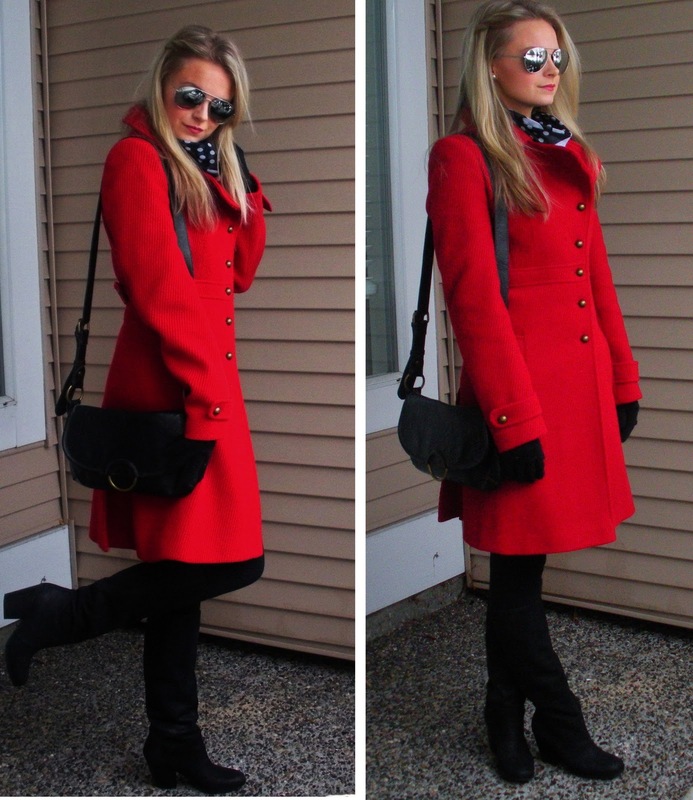 Peacoats like this one are perfect on days you don’t want to put together a real outfit. You would never know it, but under my jacket I had on comfy leggings and a plain old shirt. Nothing fancy, but with the jacket on top I look much more put together. 1)Dark, dreary January was probably not the best month to start a blog that is based on photos. The outdoor lighting is horrible and the rain and/or snow is never ending in Vancouver. 2)Bright red does not read well on camera. Note to self: don’t do a blog post on a full length, bright red jacket that takes up the whole frame because no matter how much you edit, it won’t look quite right. Ahh yes, the self taught lessons of being an amateur blogger. I am so totally obsessed with red at the moment! Coming across your posts actually made me happy! I am in love with your coat! I was looking for a red one for ages, but can't seem to find one anywhere for a descent price! Stunning!